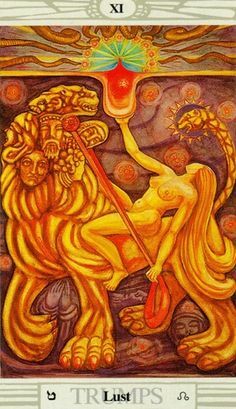 The Lust (Strength) Tarot Trump, painted by Lady Frieda Harris (1877-1962 for the Thoth Deck. Traditionally this is the Strength card in the Tarot major arcana, but is called Lust in the Thoth deck — a perfect example of higher and lower expressions of this energy. As ever, I’ve been enjoying two recent articles from my blog-sister Janet Chui’s Magic & Meditation blog, and want to share both with you. Have a look and you’ll see why. Each is like a mini feast, each in its own way. 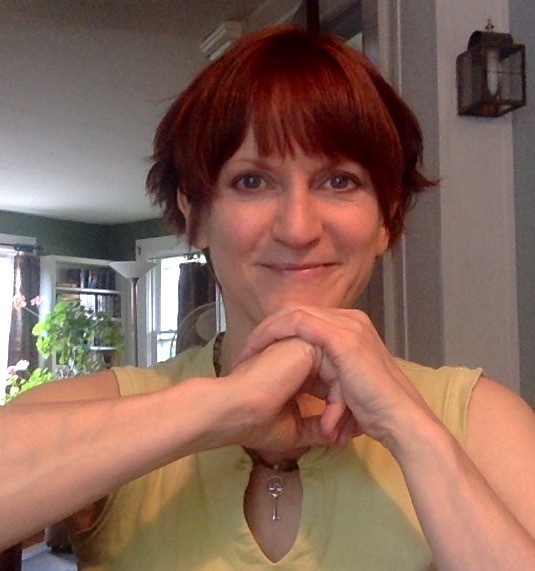 In her 8/8, Lion’s Gate, Sun in Leo, Cecil, Strength, and More Lion Stories, Janet shares insightful, heartful (very ‘healthy Leo’!) musings about just these topics. This one is a very timely post (some power-juju kicking up in the Leo archetype pool right now), and it includes a tidbit on the imbecile-dentist from Minnesota who, perhaps a little too drunk on Leo-esque Macho Juice, shot the human-acclimated Cecil the Lion whilst ‘trophy hunting’ in Zimbabwe earlier in the month. (He apparently tried to impress a waitress with the gruesome photos afterward … apparently no one gave this guy the memo that slaughtering Leo the Friendly Lion isn’t really a turn-on, and if it is, you should be very, very afraid. DOH! As my late father would have wryly said whilst shaking his head, “Idiots on our team.”). 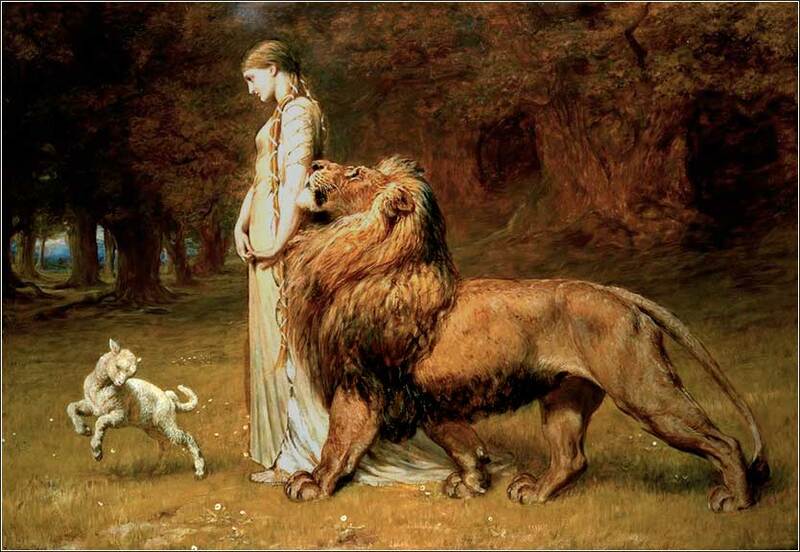 Una and the Lion, 1880, by Briton Riviere. 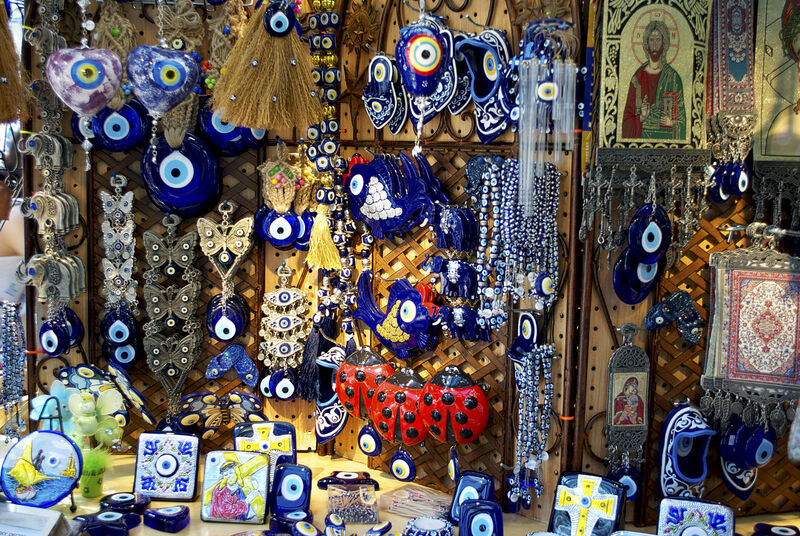 Public domain image courtesy of Wikimedia. Whether that particular bit appeals to you or not (and I’m sure at the core, it doesn’t appeal to any of us, cuz it’s depraved behavior gone all Jupiter-Leo on us! ), check out this Leonine post from Janet for other lovely, mythical mentions about Strength, Leo, and the Lions of Myth (and Singapore). Secondly, in Janet’s Tea Time with Deep Breaths, she’s shared a sampling of interesting niblets with us as we hover on the precipice, at the edge, on the brink (that’d be energies of now talk). The brains of angry men (with uncontrollable tempers), internet trolls, people who interrupt women, and reasons why you shouldn’t ‘go raw’ are mentioned. Just sayin’, that’s an interesting line-up. Find Janet’s Tea Time With Deep Breaths delectable post here. Thanks, Janet, for another tea time of reading (though I had mine with soup today). And for those in the Northern hemisphere who are at mid-Summer, a happy Lughnasadh to you (as some of our ancestors would have said). To those of you in the Southern hemi, may the kindling light of Imbolc stir your Spring dreamings. Featured image credit: The Royal Lion and Lioness. Image courtesy of PD Photos. Thanks for the shout-out and wonderful commentary!